I’m here to help with your problem and guide you through it. I want to teach you everything I can so you can manage it. Manage your illness before it manages you! 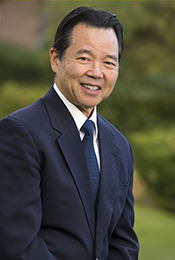 Dennis Yamamoto, M.D. interest in medicine came late in his educational pursuits, and even a bit unexpectedly, when as a graduate student at Michigan State, a friend suggested they take jobs as orderlies at the local hospital. He seized the opportunity to work in a hospital and soon found that medicine was the career he never knew he always wanted. He pursued his Medical Doctorate at Michigan State, and chose gastroenterology as his subspecialty, fascinated by the field’s potential for exploring a variety of interventional therapies. Dr. Yamamoto did his internship, residency, and fellowship at the University of Wisconsin, where he was Chief Resident and worked for six years after graduation as a Clinical Assistant Professor and Staff Gastroenterologist. In 1985, he was among the founding physicians of Digestive Health Associates. He is currently a Clinical Assistant Professor at the University of Nevada – Reno. He is on the Board of Directors at St. Mary’s Regional Medical Center in Reno, as well as being the Chief of Staff at St. Mary’s from 1996-1998. He has also been on St. Mary’s Regional Medical Center Foundation Board since 1999. In addition to his work at St. Mary’s, Dr. Yamamoto is also on the board of directors for the Community Health Alliance in Reno. His specialty is in the treatment of Celiac Disease, and he hosts speaking engagements each a year on Celiac Disease. The biggest advancement in gastroenterology obeserved in his lifetime is a curative treatment for hepatitis C, which can now be cured 95 percent of the time. He’s also amazed at the minimally invasive techniques available to make diagnoses, and the patients’ accessibility to information. Dr. Yamamoto is proud to be part of Digestive Health Center because they’re easy to deal with. “We’re easy to access and personable. In the impersonal world of medicine, we’re trying to give that personal touch.” When he’s not working, Dr. Yamamoto is an avid golfer. He loves to compete in local golf tournaments while also crafting golf clubs himself. Bachelor of Science in Zoology, Michigan State University, East Lansing, Mich. Doctor of Medicine, Michigan State University, Lansing, Mich.
Internship, University of Wisconsin, Madison, Wis.
Residency in Internal Medicine, University of Wisconsin, Madison, Wis.
Chief Medical Resident, University of Wisconsin, Madison, Wis.
Fellowship in Gastroenterology, University of Wisconsin, Madison, Wis.